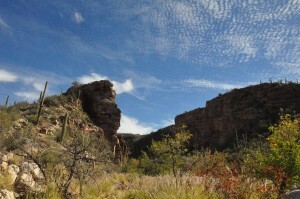 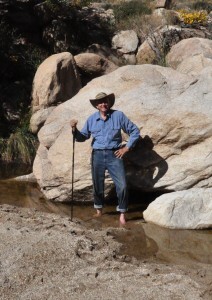 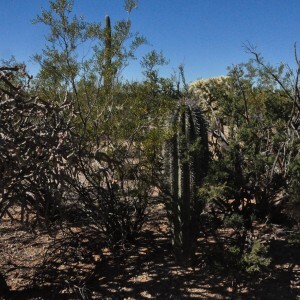 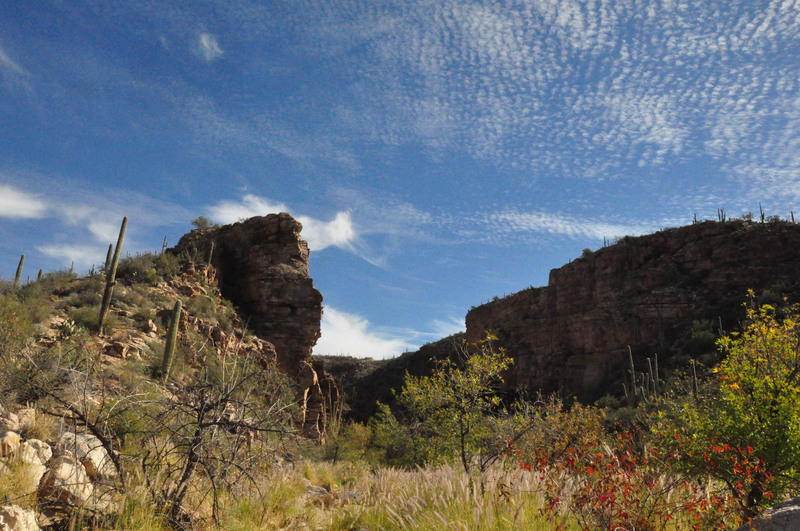 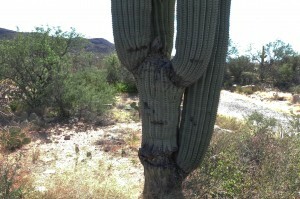 On November 26, Ed and I took a leisurely walk in Saguaro National Park East. Even this late in the year there were a number of plants in full and glorious bloom, notably the Paper Flower. 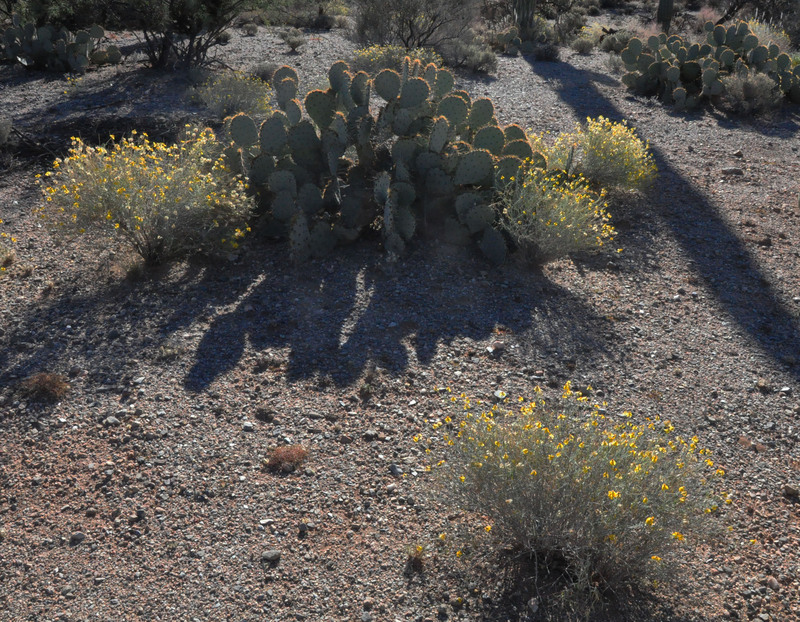 Paper flowers (Psilostrophe cooperi) with a prickly pear in the center. Our attention was drawn more to the cactuses, especially the dominant cactus of the Sonoran Desert, the Saguaro. 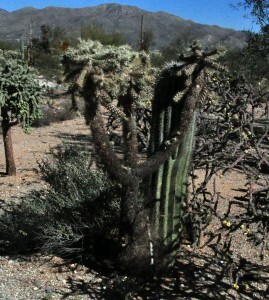 With various losses and new growths, some of them take on amazing forms. 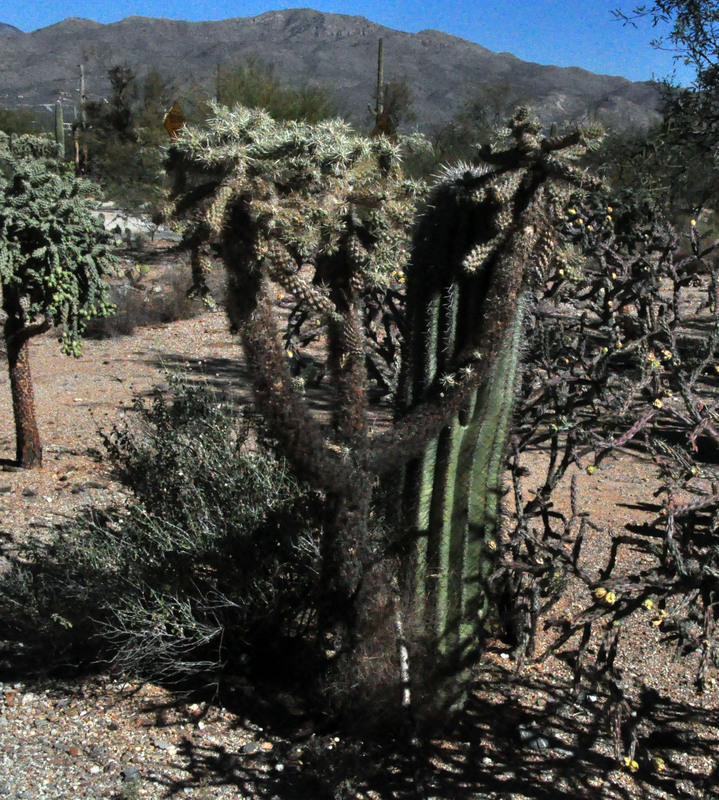 The base of the odd fellow. 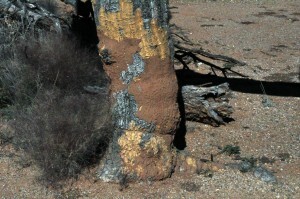 The brown, I believe, is made by termites. 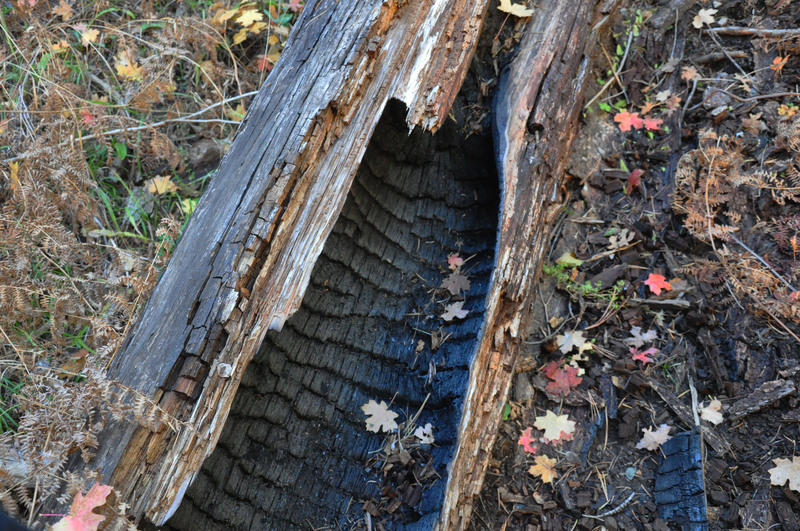 When they have completed their life cycle, they shed their thick green skin, and the mushy interior, to reveal the long, thin wooden ribs that form a skeleton. 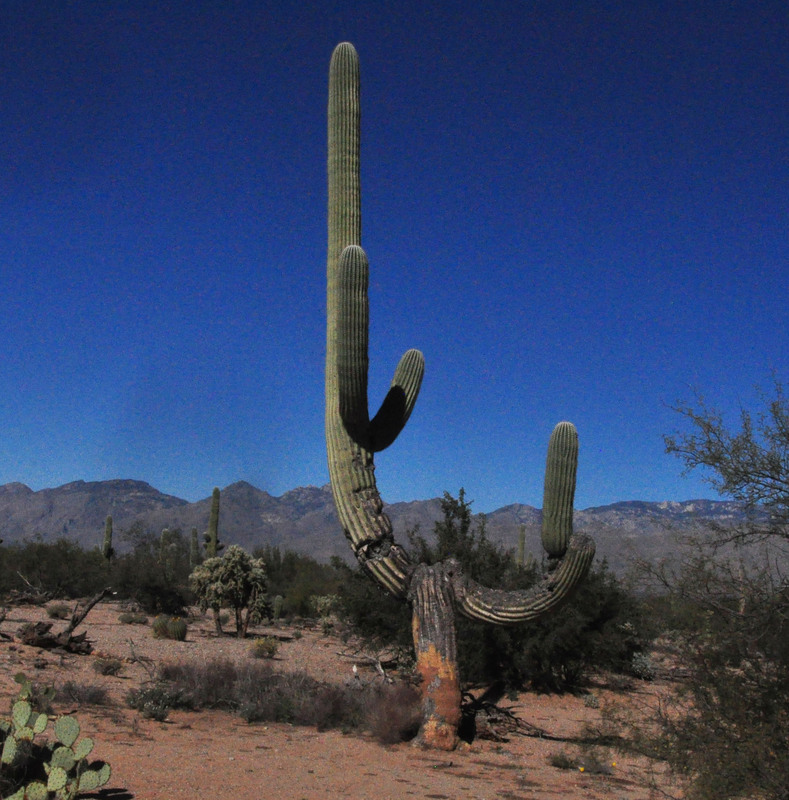 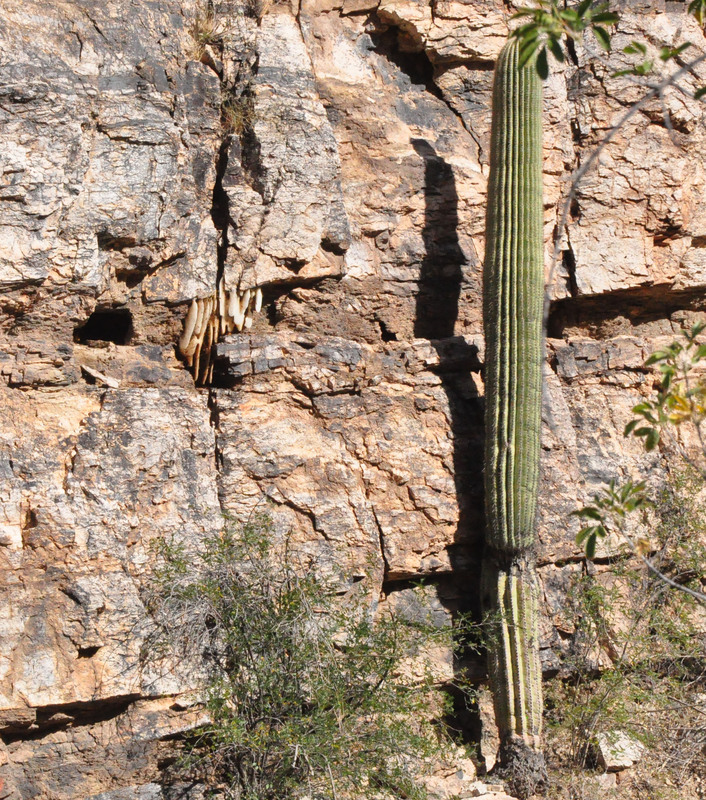 Normally a saguaro does not grow arms until it is about sixty years old. We saw a small one (that could have been twenty years old), with a branch, and wondered about it. 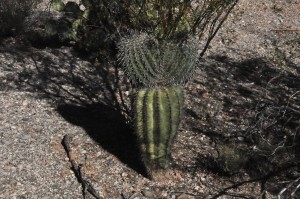 Perhaps it grew an arm due to an injury. Then we saw a short one with two symmetrical arms at the top, like bunny ears. The new arm is at the base on the left. 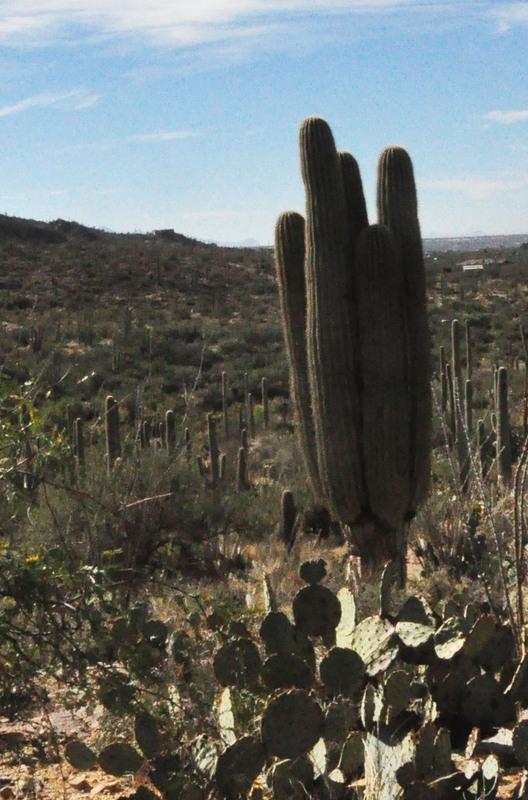 What looks like an arm on the right is a small cactus just beyond it. 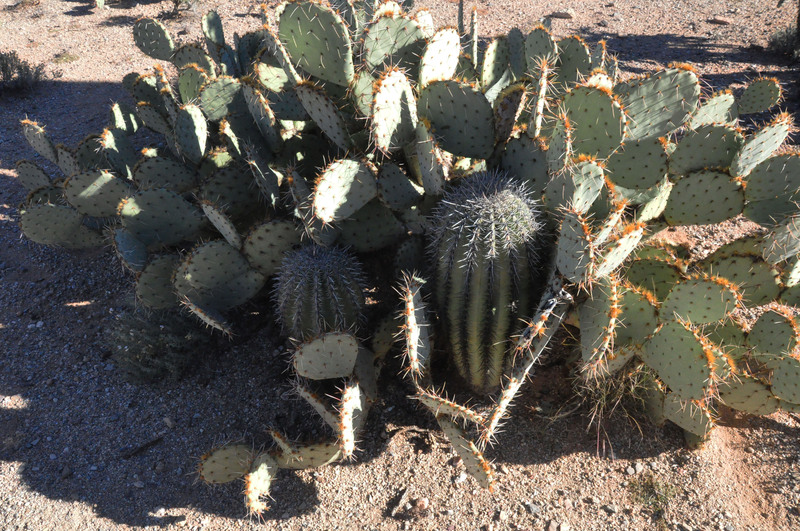 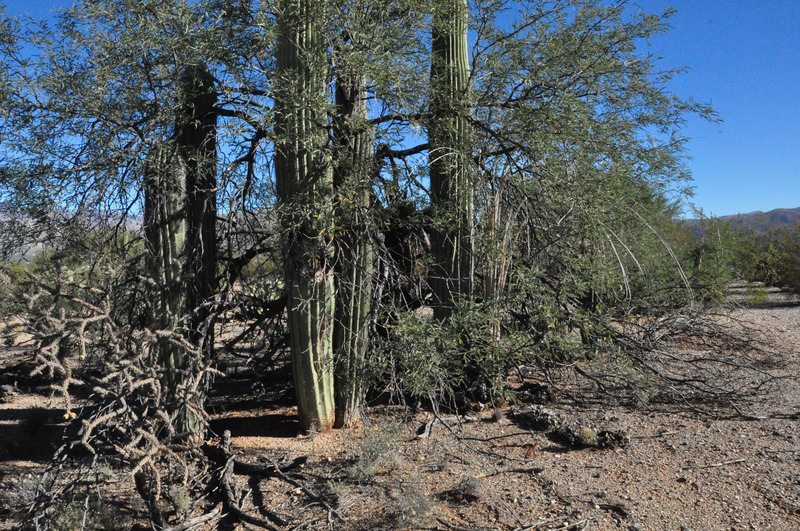 Our special interest was in the nursery plants that support Saguaros in their very vulnerable early years. For some reason we had not until then, paid much attention to what particular plants provide shade and shelter for the saguaro seedlings. 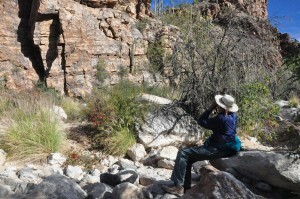 On this short walk we identified six different species, some of which were quite a surprise to us. 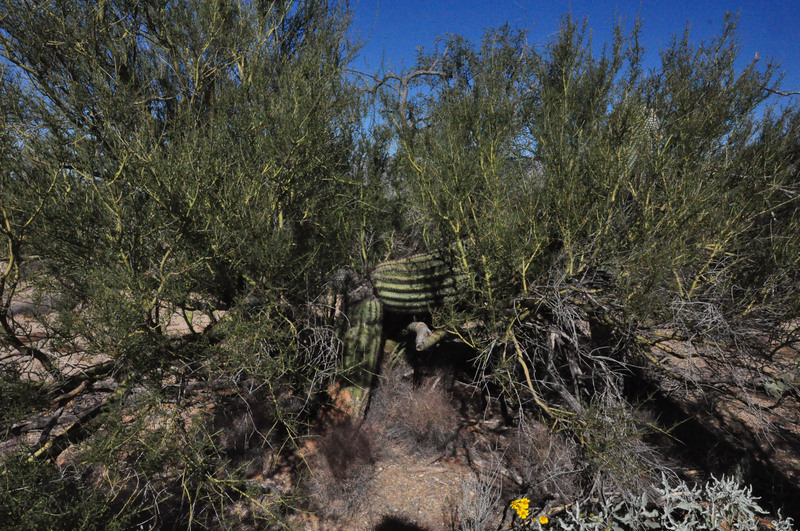 One saguaro growing under a Paloverde. Note how the central trunk broke off, and a large arm extends to the right. Then we came across a semicircle of huge saguaros. 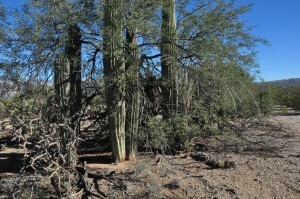 Lying at the center of the circle was a fallen Paloverde tree, its branches extending in all directions from the center. 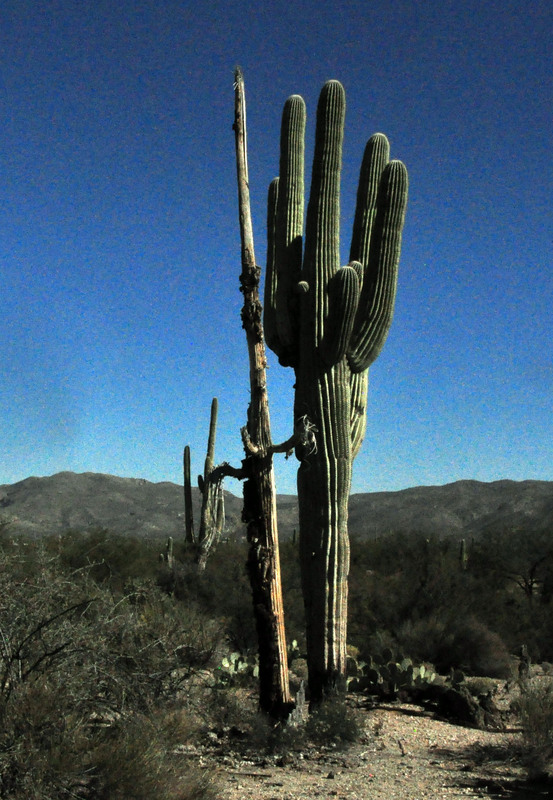 The saguaros looked as if they were standing at attention to honor their fallen mother. 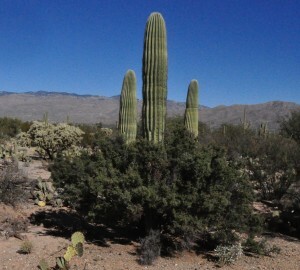 Almost as far as the eye could see saguaros towered above the other vegetation. 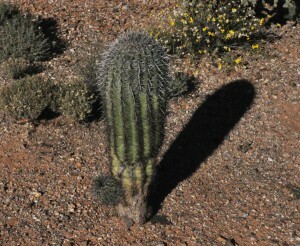 What a remarkable plant. 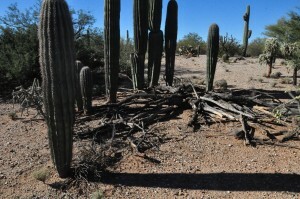 What a rich desert! About ten days ago Ed and I hiked in Marshall Gulch, just above 8000 feet in elevation. 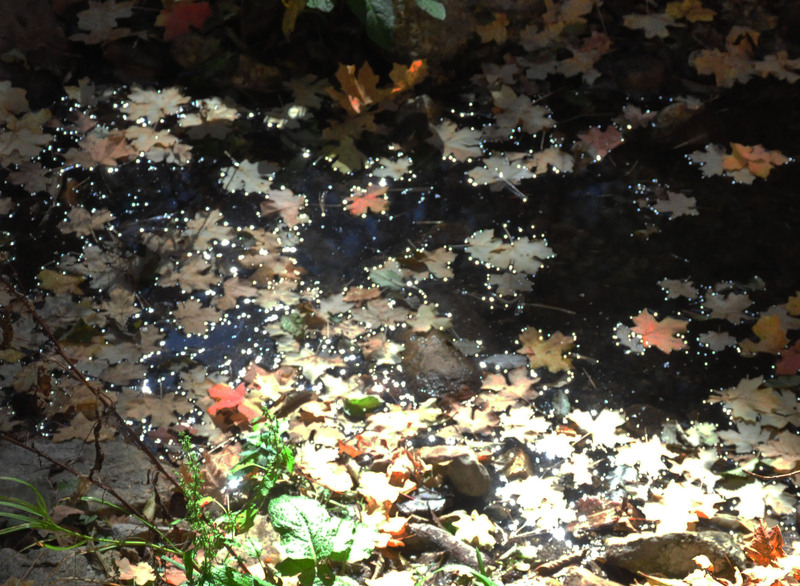 Though it was toward the end of October there was till plenty of color in the maple leaves. 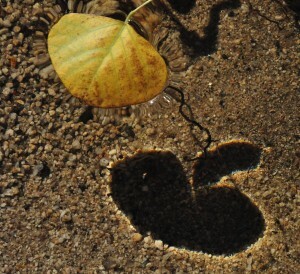 I was particularly fascinated with the way in which the leaves that have fallen into the stream distort the normally flat surface of the water. 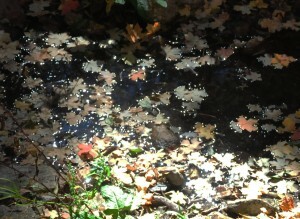 At the right angle the sun reflects off of these depressions creating the effect of having each leaf rimmed with stars. We passed a fallen tree, and noticed that the cut end of the tree was populated with a number of fungi, in a variety of colors. 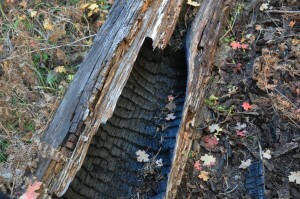 The core of another log had evidently been burned out in one of the mountain fires. 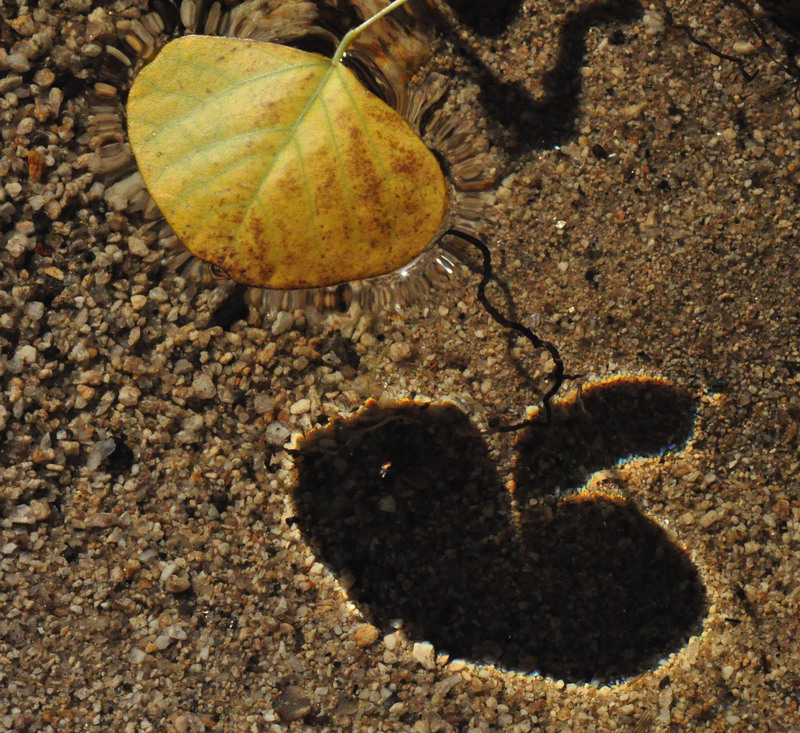 We found the overlapping scale effect quite interesting. 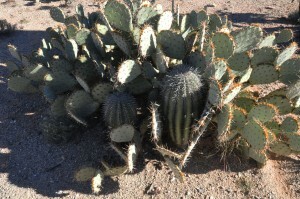 The temperature has finally dropped a little and walking in the desert is comfortable and rewarding. 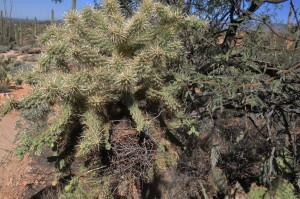 Ed and I had a pleasant amble in Saguaro National Park East this week and saw more than a dozen plant species in bloom. In addition we enjoyed seeing the remarkable nest of the Cactus wren (ampylorhynchus brunneicapillus, State bird of Arizona), in the densely thorned Jumping Cholla (Cylindropuntia Bigelovii). 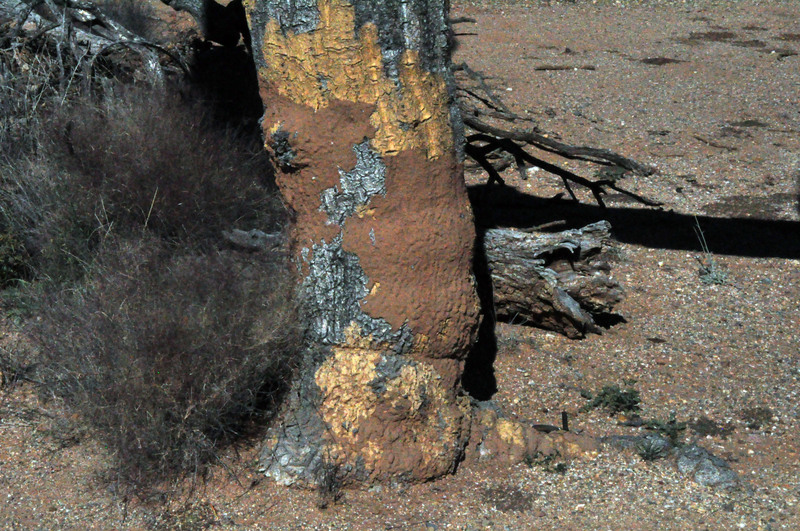 The nest was at least a foot long, shaped like an elongated football, lying horizontal with an opening at the end. We also found a chain-fruit cholla (Cylindropuntia fulgida), with a beautifully formed nest. 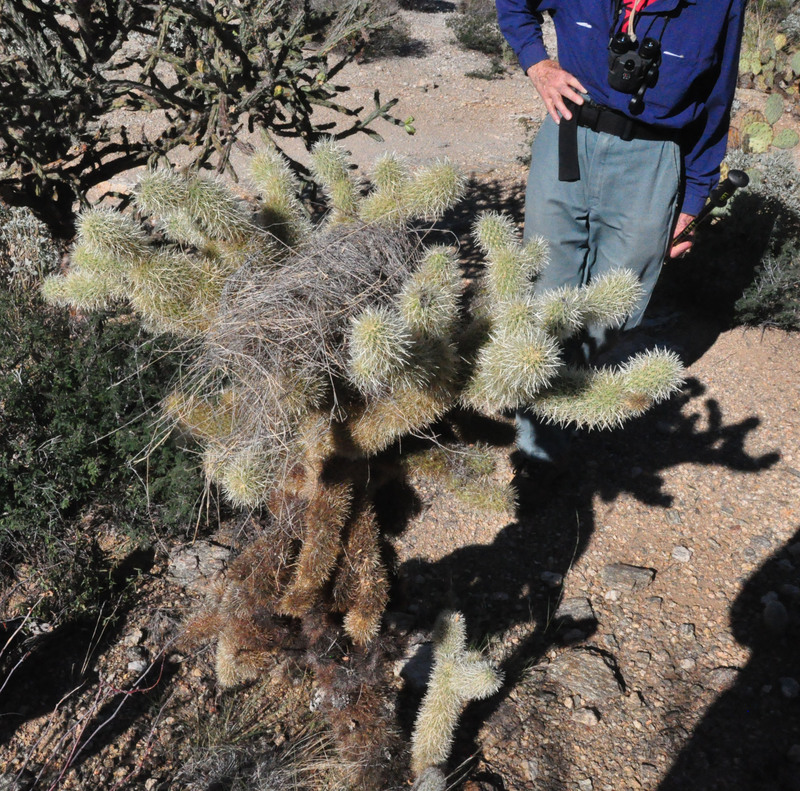 Ed suggested it might belong to a curve-billed thrasher (Toxostoma curvirostre). 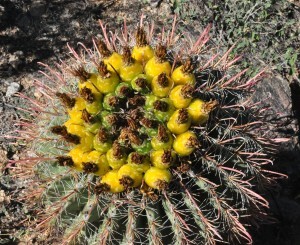 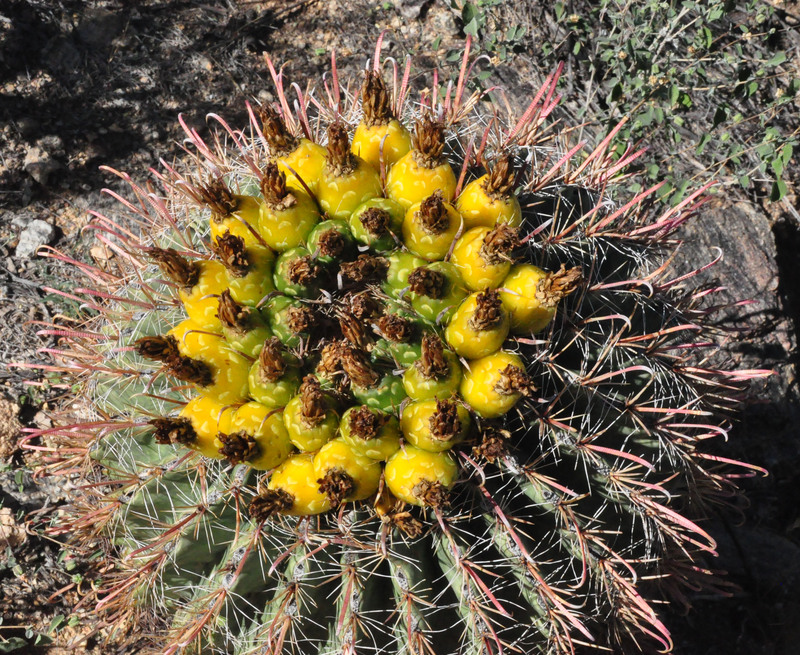 A Barrel cactus (Ferocactus wislizenii) normally forms a single round ball, extending to a long cylinder as it grows, with a crown of flowers, and later fruit at the top. 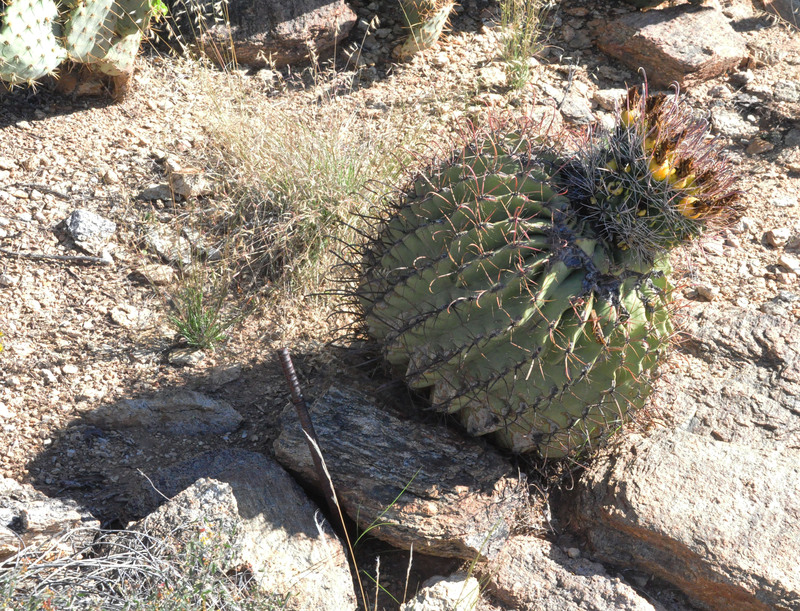 We saw one that had an extra layer, possibly a separate barrel cactus growing on top of it, with fruit. 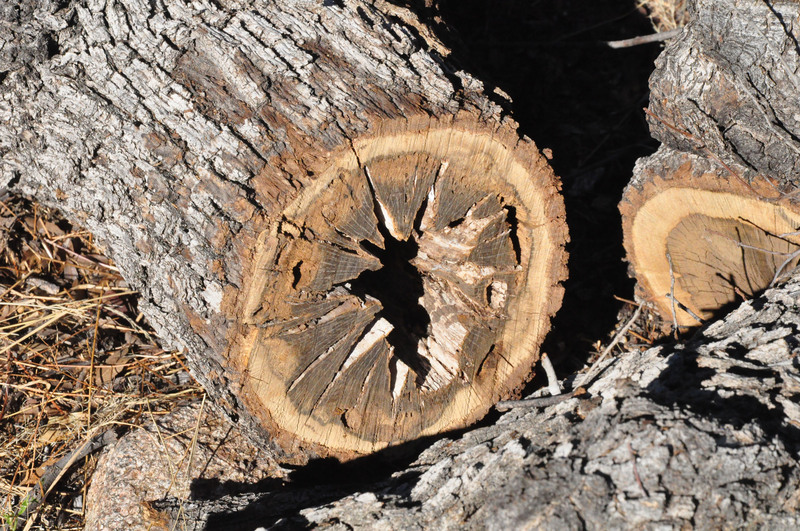 Hiking in Molino basin, we came across a Mexican blue oak (Quercus oblongifolia) that had fallen some time ago, and was now being cut up. 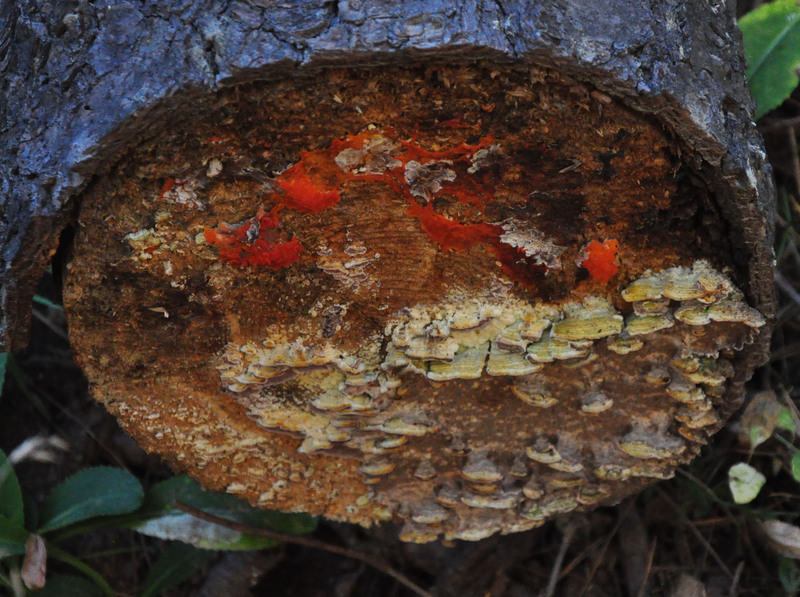 I found the cross-section fascinating. 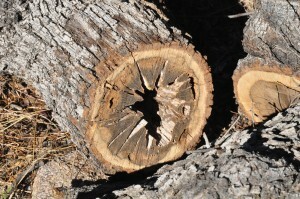 The heart-wood had rotted out, and left an empty center with star-like channels growing toward the bark. 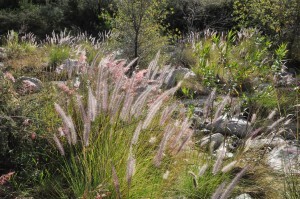 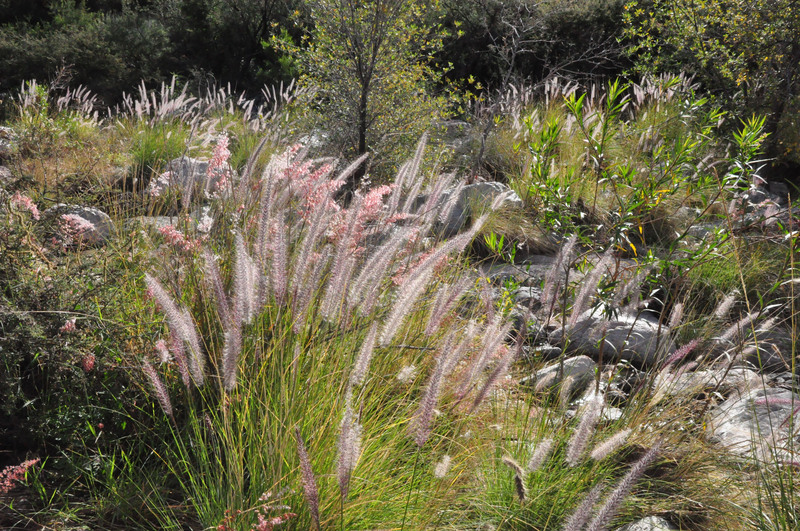 The growing season is slowing down, but there is still a wealth of beauty to enjoy.